Like many of you I’ve been trying to kill the Haywire Sunreaver Construct to try and get the pet to drop ever since the patch dropped on Tuesday. Well today while I was doing dailies with my daughter the construct suddenly popped up on my Silverdragon add on. We hightailed it to the beach and were the first ones to tag it. A few seconds later some other players joined in, thankfully, which gave me time to deal with the group of Saurok I had accidentally aggro’d while racing to the Construct. After the saurok died it was a pretty easy, if long, fight. 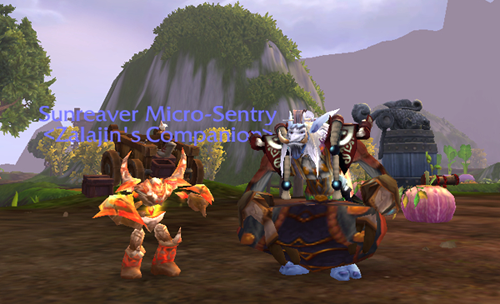 At the end both myself and my daughter had the Sunreaver Micro-Sentry pet, and a Key to the Vault room. In other news my raid team is on hiatus until the first week in April. A few of our key members will be on vacation. This gives us some time to recruit. We lost a few members to real life during 5.1 (I hate when RL gets in the way). So we’re looking for new players in all rolls. If you’re interested in raiding with the Gangstas please drop me or Ruction a line. Finally, last night we held a guild run into Heart of Fear(LFR) and the thing I’ve been working for ever since Pandaria’s launch finally dropped for me. Kri’tak, Imperial Scepter of the Swarm is mine! I quickly dropped my Legendary gem in it and had it enchanted. Now my Mindbender looks like a little Sha!!! Gotta love it! I think I want to try and raid with you again. My gear is too low right now. If I work on that, would you be willing to give me a shot? Sure, We raid Tuesday and Thursday nights from 7:30 pm to 10 pm server time. If you get your gear up and that works with your work schedule we’d be happy to have you on the team. We have one other hunter though so there might be a little competition for gear drops. Congrats on snagging that pet, have you used the Key for the vault room yet? How is it? I’ve done it a few times now, on live and PTR, not much involved, just go in and grab as much stuff before the time runs out. You usually get a lot of gold, Elder tokens, and if you’re lucky keys to the larger chests at the end. It’s fun though. There are traps, and spiders that you have to avoid/kill. etc etc.